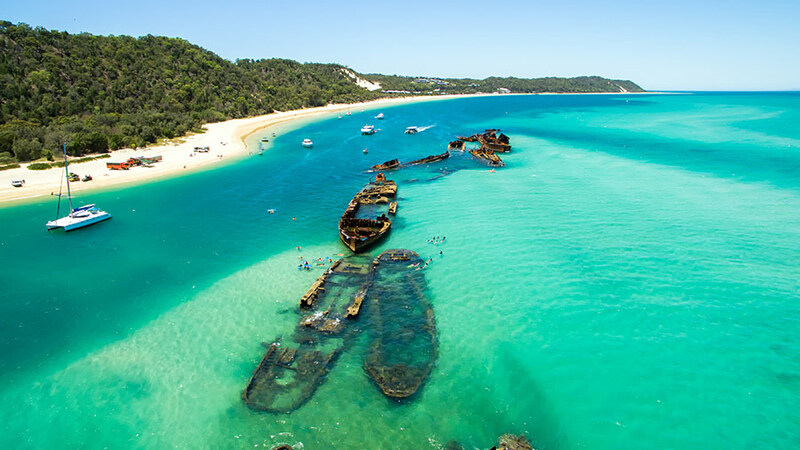 About 15 years ago, a single Lord Mayor in Brisbane, South East Queensland, Australia, made a small change that sent ripples into the world of water. This brilliant idea was based simply on the concept of giving citizens information about the quality of their own water. To this point, top-down water management strategies in Brisbane had not helped to sufficiently improve water quality in the Moreton Bay. This bay had previously attracted significant numbers of tourists and served as an important driver for the regional economy. Poor water quality was lowering tourist interest and removing tourist dollars. The Lord Mayor wanted something to change. So, he started an initiative which became what is possibly the most successful example of a publicly-driven watershed program in the world, the Healthy Waterways Partnership. This entire program was built upon the assumption that if information (on water quality) was gathered and made public it would drive eventual resolution of water problems, ultimately repairing both the ecosystem and the regional economy. He invited eight officials from local governments to begin a program of data collection in their watersheds. Scientists were requested to gather information on the health of regional fresh water, estuarine and marine sites. Data was delivered back to the Board of the Healthy Waterways Partnership (HWP) then made public via a single “grade” in the local paper (A to F). Now, annual assessments are made of each watershed in South East Queensland (18 catchments; Figure 1). Figure 1. 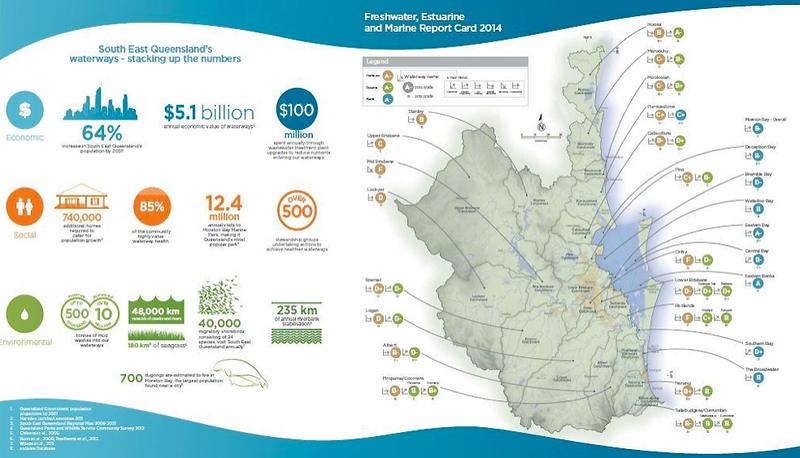 Report card on water quality in freshwater, marine and estuarine water bodies within watersheds in South East Queensland with grade for each participating catchment. Public pride is generated when watersheds are upgraded. When conditions are downgraded the public puts pressure on local leadership to make water quality improvements. Catchments and public officials work hard to keep up their “grades.” The economy is improving and a population of potentially 3 million citizens has now become aware of the condition of their water and expects it to be clean and available. Planning and development as well as community and educational objectives are now built around the premise that this water should be clean and available. Scientists continue to contribute data and opinions which affect policy. Report cards will soon be upgraded to show economic losses and gains associated with water conditions in each watershed. Financial resources of local governments have been pooled and the program has become so successful that the federal government is now pouring money into it. In the meantime, a world of water scientists, city and resource managers and business interests look to this initiative as an innovative and elegant solution which has managed to rise above the normal din of stakeholder squabble and gridlock. I want to hear more stories like this one, which was described to me in an interview with Dr. Stuart Bunn, Director of the Australian Rivers Institute at Griffith University. Dr. Bunn is the Chairman of the Executive Scientific Expert Panel which coordinates delivery of scientific data and advice to the Healthy Waterways Board. I don’t just want to hear stories like these because they are hopeful and help to create public awareness about water and improve water quality at the same time: I want to write a book about them. I have been observing squabbles over water for almost 20 years. My first taste of stalemate and contention came while spending years at Reelfoot Lake in NW Tennessee, peacefully fishing, teaching and dragging around my plankton net. But this beautiful and exceptionally-productive water body belies its reality; it is a hotbed of controversy. Lawyers, boaters, land owners, resource managers, scientists, environmentalists, fisherman, duck hunters and farmers all have competing interests in this unique aquatic ecosystem. The level of the water in the lake is artificially maintained at ~282 feet above sea level by the state which owns everything below that mark. In this quagmire it goes something like this: Duck hunters want the water level kept up and the backwaters flooded to attract duck and geese. Farmers want the water drawn down so they can (understandably) take advantage of every inch of their cropland. Resort owners and fishermen want it somewhere in between depending on who’s talking. Natural resource managers are stuck in the middle of a wide range of stakeholder opinion, anger, litigation and more. These people mean business. Many of them come to public meetings loaded for more than duck. When I began to take note of this stakeholder stand-off, I thought to myself: “What would it take to bring these people to an agreement?” I felt there must be some way to do it and I set a course to find the answer. Water problems throughout the world are well documented and ample models exist to predict that our current trajectory is taking us down a very dangerous path. Rather than continue to read about the problem I would like to write about the solution; solutions which actually exist around the world and seem to be working, like the Healthy Waterways Partnership. Some literature on the biology of conciliation suggests that rather than being prone to conflict, we may actually be hard-wired for compromise. This is really quite logical since conciliation strengthens group bonds which ensure the health and survival of a community. Examples exist throughout the world of how this relates to the sharing and protection of water resources and I intend to investigate what makes these agreements stand the test of time. What can we learn from these projects that will support others in coming to similar consensus? Why were some unsuccessful? What keeps people engaged in the process? My goal is to approach this issue from the standpoint of multiple stakeholders. This ensures a more realistic interpretation of how members of diverse and often divergent interest groups are interpreting the process and will provide a final product which is of greater benefit to a wider audience. It is interesting to note that several recurrent themes have surfaced in my interviews, observations and reading to this stage which continually point to success in these initiatives. These include such things as respect, transparency, sharing, leadership (particularly local), lots of time spent together, and making certain all stakeholders and sectors have a voice within the process. There are plenty of reasons to be concerned about our future, especially the future of our water. But I believe there are also abundant reasons to hope. We have had adequate warning that now is the time to bring everything to bear on the problems that face us. We must have robust science, but more, communities need straight-forward information and leadership to help them understand and take on these challenges. I am a hard scientist, but I refused to be hard-headed. I am willing to shed any thin skin that makes me too proud to realize that although I think my data sets are amazing, they will be even more amazing if they can be used to help the world solve its problems, the most urgent being to provide the future with clean, fresh water. We got ourselves here and if we learn to work together with open minds and informed visions I believe we can get ourselves out.